Many of today's music producers and DJs create great work in their home or project studios, and rarely get to show off their music live. Seattle's annual Laptop Battle provides an opportunity for them to compete with fellow artists in a single-elimination tournament in front of a loud, appreciative crowd. The battle, which lasts about four hours, features 16 contestants, each of whom gets three minutes to do his or her magic using a laptop and one MIDI controller, to try to advance to the next level of competition. Originality in musical performance, technical ability, and crowd interaction are all factors in judging. The performance space was outfitted with an all-Mackie system, including a 1604VLZ analog mixer, five SRM450 portable powered loudspeakers, and a pair of SWA2801 subwoofers.Producer and DJ Andrew Luck produced his first laptop battle event in Salt Lake City in 2005, then moved to Seattle and began participating in laptop battles there. Held at the Fred Wildlife Refuge—a two-story art facility that is a refuge for artists, not animals, as the name suggests—the 2015 Laptop Battle was hosted by Seattle dancehall legend and emcee Mista Chatman, with Luck producing. Mackie has long been a major sponsor of these events, providing the PA system and prizes. The space was outfitted with an all-Mackie system, including a 1604VLZ analog mixer, five SRM450 portable powered loudspeakers, and a pair of SWA2801 subwoofers. "We use it for a variety of events every weekend, and it has been very reliable and treated us well," said Luck. "We're fans of Mackie PA gear. So when we needed an additional stage mixer and speakers for the laptop battle, naturally, we turned to Mackie." The stage mixer had to be easy to use and offer tactile controls because the artists would use it to mix live, and they would have no time to learn a complicated interface. 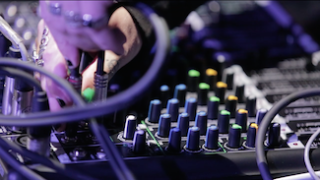 "We've used a Mackie mixer for the past several laptop battles, and we really love them. The Mackie has been the core of our system," Luck recalled. "This year, we went with the new ProFX12v2, which was just what we needed. It has the tactile faders and knobs we want and plenty of line-level inputs, and it's very easy to use. It sounded great with the SRM speakers!" "The SRM650s were the right choice," noted Luck. "They blended very well with our Mackie subwoofers. They filled the room beautifully, with power to spare." Mackie provided prizes for the battle. "This year, Mackie donated a pair of their CR4 four-inch multimedia monitors, which are very cool," Luck said. "A lot of the contestants live in the city, and they want quality sound but can't use bigger speakers. Mackie is known for studio monitors, so the contestants were excited about the chance to win the compact CR4s!" Going forward, Luck pointed to the next incarnation of Laptop Battle, laptopbattle.com. "The new online site allows users to download sound packs each month, and test their production and performance skills against other producers by uploading videos of their performances," he said. "The site will enable us to help solidify our global community of computer musicians, interact with each other, and discover new artists. Our biggest goal is to continue to improve computer music performance, and provide a space where competitors can learn. Mackie has helped us raise the stakes, both with great gear and by providing awesome prizes. They've been truly supportive."